NEW YORK - Sept. 5, 2018 - PRLog -- Itochu Cable Systems ("ICS"), the leading Japanese broadcast and video technology integrator, and Streamroot, the provider of the world's most extensive distributed delivery network for OTT video, announced today a strategic partnership for online video delivery. ICS is a subsidiary of the great Itochu Corporation - one of the five Japanese sōgō shōsha, that has been trading commodities, goods and services since 1858. Through its operations in the fields of cable television, satellite and terrestrial broadcasting, as well as IP broadcasting and in-house video distribution, ICS has earned its place as the leading systems integrator in the industries of video, audio and telecommunication in Japan. Equipped with in-house technical expertise, as well as valuable technology partners, ICS contributes to its customers development by supplying them with the latest technology products, systems and reliable services. As part of its efforts to curate the most relevant, innovative and reliable solutions for its customers, ICS has chosen Streamroot as its strategic OTT delivery partner, and will act as an official reseller of Streamroot's industry-leading peer-accelerated delivery technology in Japan. ICS' new and existing customers are now able to benefit from Streamroot's patented video delivery solution, Streamroot DNA™, allowing them to easily scale to higher volumes of traffic, while improving viewers' experience and significantly reducing bandwidth costs. 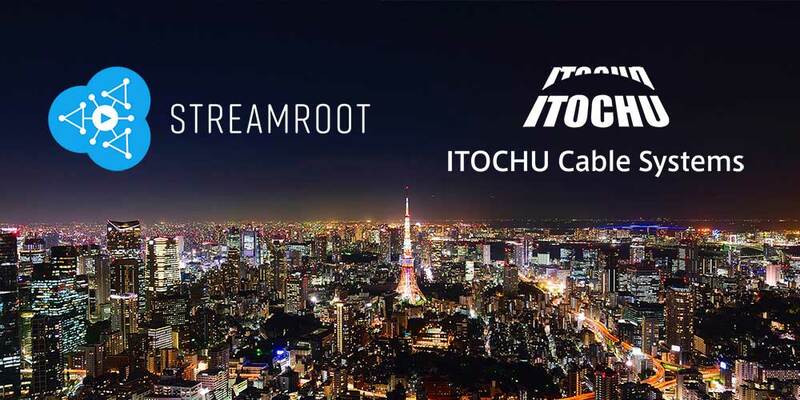 "Streamroot is proud to partner with Itochu Cable Systems," says Streamroot Co-Founder and CEO, Pierre-Louis Theron. "Partnering with ICS is a natural move for Streamroot; both our companies have a reputation of uncompromised professionalism and industry expertise, and we're very much looking forward to working side-by-side with ICS experts to help Japanese broadcasters and OVPs overcome the OTT delivery challenges of the Zettabyte era." "Our clients turn to us for our expertise and professional excellence. We are very pleased to join forces with Streamroot, and to be able to provide our customers with Streamroot's innovative streaming-at-scale solution," said President and CEO, Kenji Tsuchiya at Itochu Cable Systems. "We see great potential for Streamroot's technology in Japan, and we're looking forward to collaborate with Streamroot's experts to drive customer success together." Streamroot will be showcasing its solution at the IBC Show, September 13-18, at booth 14.C12. It will also be demonstrating as a part of ICS end-end OTT solution at InterBEE, November 14-16. Established in 1986 as a subsidiary of Itochu Corporation's cable TV, this year marks the 32nd anniversary of its founding. By integrating business organization with HOEI company which was a subsidiary in October 2016, we stand as the only multi-vendor based systems integrator with advanced know-how and a wealth of achievements, including broadcasting, Audio and telecommunication. We are expanding our business to OTT, IP video and enterprise video platform. Streamroot is a leading provider of innovative OTT delivery technologies for media groups, content publishers and enterprise customers. Powering over 20 million video sessions every day, Streamroot's Distributed Network Architecture – Streamroot DNA™ – offers broadcasters a key competitive advantage through improved quality of service, greater audience reach and infinite delivery capacity with zero infrastructure investment. Plug-in free for viewers, Streamroot delivery solutions integrate seamlessly into broadcasters' existing video workflows. Streamroot is supported on all major web and mobile platforms, as well as set-top boxes and smart TVs, providing the most comprehensive user coverage on the market. For more information visit https://streamroot.io.